As we get older, our childhood memories tend to fade. One memory that still stands out is making snow ice cream at my friend’s house. I had no idea you could make ice cream from snow! Is it safe to eat snow ice cream? Of course, we all know to avoid the yellow snow. Frank Zappa always comes to mind, “Watch out where the huskies go, and don’t you eat that yellow snow.” My children never get the reference, especially since we have akitas. 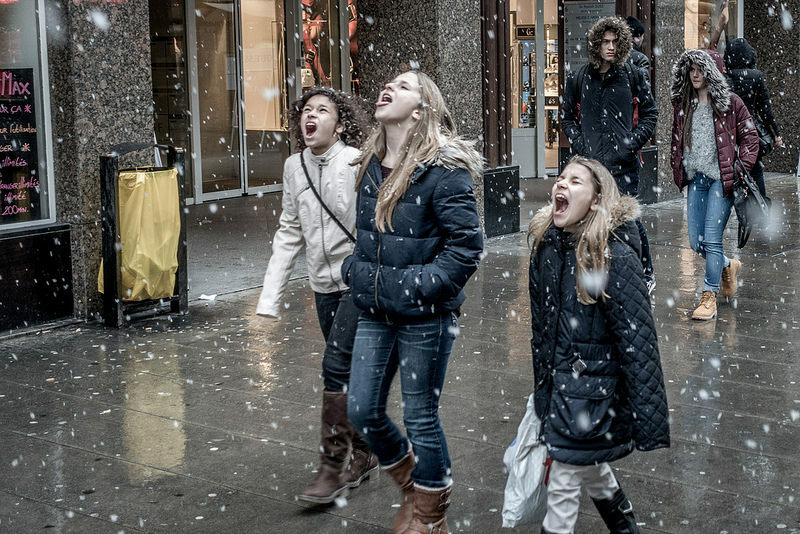 In an article from 2008, we cautioned that snow can contain toxic particles, especially if you life near a city. Snow acts as a reservoir for acids in wintertime by absorbing and storing atmospheric pollutants. Falling snow collects pollutants in the atmosphere and snow also accumulates pollutants on the ground from the dry deposition of gases, aerosols, and atmospheric particles. Normally, snow protects vegetation from the harmful effects of dry deposition for several months. The solubility of sulphur dioxide in snow is highest just before the snow melts because the amount of water in the snow is at its highest. “Black snow” is coloured by carbon rich particles and it has higher concentrations of acids than the other snow. The pH of black snow can be nearly as low as vinegar – about pH 3.0! Black snowfalls have been observed on Cairngorm Mountain in the Scottish Highlands where pollutants from Eastern Europe accumulate. When black snow forms just above the base of the snow drift, it can deliver especially high solute concentrations to the soil below. Definitely avoid the black snow! But how much snow does one really eat? It can’t be worse than the water in Flint! 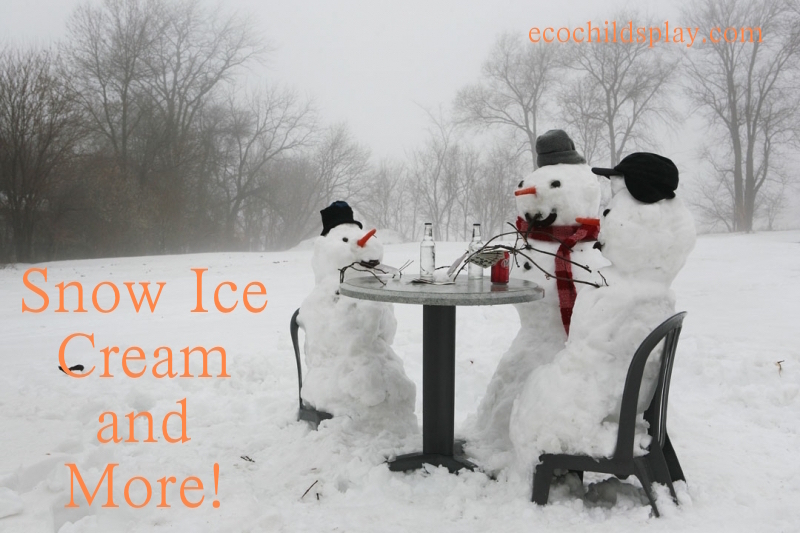 Fresh Snow Ice Cream Recipes and more! Simply scoop some snow into a cup or paper cone if you have it and drizzle with organic maple syrup. Add bourbon or brandy for the grown-ups! This recipe could easly be made with vanilla, lemon, or almond extract instead of the peppermint. Fill a flute or wine glass with snow, then add prosecco and orange juice. Now if it would only snow at my house! I can’t wait to try the last snow recipe! « How to throw an eco-friendly party! When our kids were growing up (where we live back in the woods in AK), one of our favorites was to gather a big bowl of fresh snow, bring it inside, and the kids would scoop out what they wanted and add dry Tang, vanilla, sprinkles, or whatever they wished. We also made jackwax, which I used to make in rural upstate NY when I was growing up and it was maple sugar time. When the fresh sap was boiling down but before it reached the maple syrup stage, we’d gather bowls of fresh snow and sprinkle it with the hot sap. It was one of our favorite treats! I’ve done it at school with my students and they can’t believe how good it is – or that they have never had it before! It works well with birch syrup, too, of course.